Chromebooks and Google Apps for Education - Time to Go All-In on the Web? About six months ago, Google gave me a prototype version of a netbook computer running their new (at that time) Chrome OS to evaluate. It's called a Chromebook (1). It is basically a laptop that runs one installed application, the Chrome web browser. It starts incredibly fast; from zero to browsing in about 8 seconds. It has a solid state drive so it is really light and the battery lasts all day (actually, it lasts me several days). Once you are running, the idea is to use web applications, like Google Apps, to get your work done, rather than install desktop apps, like Microsoft Office. To help users find web apps (and to help web developers find users), Google created the Chrome web store (2). It makes it easy to find and 'install' web apps. Over the last six months, as I used the Chromebook, I kept coming back the question, "why do I need this?" Now, I'm not saying that I did not like the Chromebook. It's really nice to have a lightweight netbook that starts so quickly. Also, it comes with a 3G cellular modem that includes 100mb of free data a month, so if I know I'll be in a place where I might not get WiFi, then I bring the Chromebook. But in terms of basic functionality, I can do everything that I do with the Chromebook on a standard netbook. So, as a consumer, do I need a Chromebook? Wednesday, at their yearly developer conference, Google IO, Google gave me the answer; I don't need it (even though it is nice), but schools do need it. 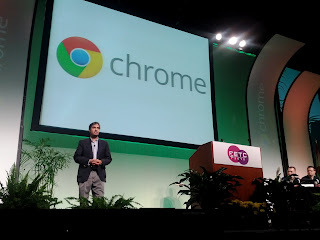 Google announced the first two commercially available Chromebooks, one from Samsung and one from Acer. More importantly, they announced a hardware 'subscription' model that allows a large customer to pay a monthly fee for the Chromebook, warranty and support. This includes the ability to manage all of these Chromebooks and their software centrally. Google is clearly positioning the Chromebook as a secure, manageable, portable productivity tool for large organizations that are interested in low cost of ownership. While that's not all that cool for typical consumers, it's very cool for schools. Schools are challenged on many, many fronts, and many people are looking to technology to fix school problems and increase student achievement. However, deploying and maintaining technology is complex and very expensive. Managing and securing large groups of computers and keeping their software up-to-date requires a highly skilled IT staff. Such folks don't come cheap. Google quoted a number that suggests it costs large enterprises about $3,000 per year per user to maintain each traditional computer and it's applications. ZDNet reckons it closer to $1,900 per year per user. Schools try to do it even cheaper. For instance, schools often extend refresh cycles to 5 years, but that leaves them with many older, slower machines that tend to fail more often. Schools also try to share a few computers between many students, but that just limits students' access to the benefits of educational technology. Even with these compromises, it is still expensive and challenging to maintain edtech. This is where the Chromebook and Google Apps for Education come in; Google announced at Google IO that they will provide Chromebooks to schools for $20 per month, per computer. Google Apps for Education is free. Google expects schools to sign up for 3 years, but that $240 per year per computer includes a warranty on the hardware, which is critical in a school environment. Importantly, all of this is designed to be centrally managed. The web-based management interface allows an IT admin to create and manage groups, customize spam filter rules, and grant access to apps and documents. This is clear distinction between Chromebooks and iPads (or even Android tablets). How can this be so cheap? Well, for one thing, you don't need antivirus software. The Chromebook is built from the ground up for security. All data on the solid state drive is encrypted, so if a Chromebook is lost, the data is still secure. Also, the hardware and bios contain routines that detect tampering each time the Chromebook is started. You don't need Microsoft Office. Google Apps for Education contains a word processor, spreadsheet, presentation, drawing software and web site creation software. You don't need Microsoft Exchange Server (or the server computers that it requires). Google Apps for Education includes email accounts and web based GMail interface for all of your users. You can also save the time and money associated with creating and deploying new disk images each year; the management console allows IT administrators to determine which users get which apps and all apps, because the are web apps, are automatically updated. For those users that must have access to desktop applications, you can use your Citrix and VMWare to provide virtualized desktops on the Chromebook (or just provide a subset of users with more traditional laptops). Tools, Curriculum and assessment software are important to schools. So, you will need to assess your current software and look for web delivered versions or alternatives. This is much easier than it used to be. Many K-12 educational technology companies are offering web versions of their products. For instance, if your school or district uses Kidspiration or Inspiration, you can use Webspiration with your Chromebook. Talking Fingers, Inc has created a web version of their great phonics product, Read, Write and Type! All of your older computers, whether they are Macs or Windows machines (or even the occasional Linux machine), can run the Chrome web browser and Google apps, so you can roll out Google Apps for Education to everyone and start saving money immediately. You don't have to commit to Chromebooks for all users all at once. You can phase Chromebooks in as part of your refresh cycle. So, is it time to go all-in on the web? Each district needs to answer that question for themselves, based on their own requirements. But now, it is clearly possible to say yes.